Mount Charleston offers a good variety of trails, long and short, even though some destinations are not especially scenic, popular in part due to the closeness of Las Vegas rather than the natural beauty. 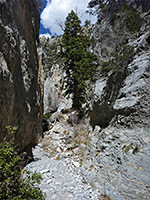 One of the more unusual paths leads up Fletcher Canyon, a north side tributary of Kyle Canyon, which starts off wide, overgrown and rather uninteresting but eventually narrows, beyond a spring and seasonal stream, and for several hundred feet forms a deep, enclosed, slot-like section framed by smooth, grey brown walls of water-polished limestone. A junction is reached 2 miles from the trailhead, and both branches also remain narrow for a short distance before becoming much shallower, gaining height more steeply. Cross-country hiking further up the left fork reaches the North Loop Trail after just over a mile, but the walk to the upper end of the narrows is a good half day hike, taking between two and three hours round trip. 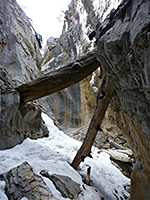 The deep, secluded passageways hold snow until April, even whilst the exposed lower reaches of the canyon can see temperatures in the 80s (F). 16 views of Fletcher Canyon. Parking for the hike is on the south side of Kyle Canyon Road, elevation 6,920 feet, while the trailhead is on the north side, marked by a map and noticeboard with general information about Mount Charleston. The hike distance is given as 1.8 miles, which is only to the spring, as this is the official destination, even though the path is still well-defined beyond, and conditions only a little more demanding. Although the trailhead parking is quite small, the hike is one of the most popular in the area. The trail enters light pine-oak woodland, descends slightly to the wide, stony wash (usually dry) leading from the canyon, then follows it upstream on the north side, climbing fairly gently, for over one mile. The scenery is not too promising at first as there are no exposed rocks or dramatic vistas; just increasingly overgrown woodland enclosing the unchanging, boulder-filled streamway. As the creek is dry for most of the year, there are few spring wildflowers in this region. Cliffs eventually rise up to the north and south, the valley gradually narrows and a short section of flowing stream appears, originating from Fletcher Spring, where the canyon curves round a tight U-shaped bend. There is no obvious end to the official trail, as the path continues along the ravine into medium-width narrows, up a few steeper sections and past a layered, curving cliff face on the south side. The gorge narrows more soon after; now there are only stones on the floor, no vegetation, and patches of snow are likely to remain into late spring. 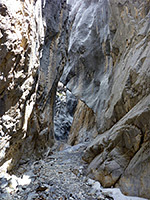 A series of enclosed, photogenic, vertical-walled passageways lead to a chokestone followed by a major junction, where the right (north) fork becomes quickly shallow, entering open, bushy terrain, while the left fork - the tightest part of the drainage - stays confined a little way further, round a few bends, until this too looses height and changes to an open wash. Following this fork entails climbing over several large chokestones. 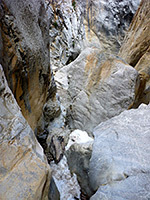 The rocks in the slots are predominately light grey in color, crossed by vertical bands of other shades, so are quite pretty, especially in spring when contrasted with the twisting path of lingering snow along the streamway.